BREAKING: A leaked image from Washington, D.C., is circulating on the internet. 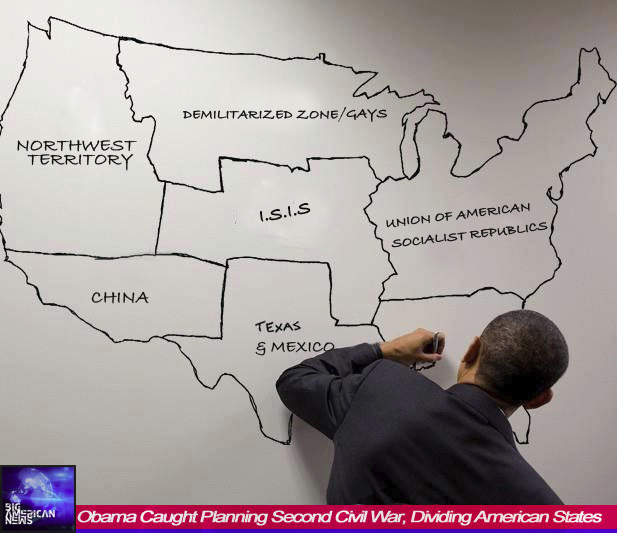 Above, we can clearly see that U.S. President Barack Obama is drawing on a map in his war room. In this map it looks like he’s envisioning a post Civil-War II America. Christians have been defeated and are likely being held in internment camps. The heartland of America, the seat of Christianity, is now controlled and given to I.S.I.S. Obama did this so there is no hope for Christianity. If you wipe out Nebraska, Kansas, Colorado, Oklahoma and Missouri, you wipe out Jesus and America. Obama knows this. We can see he’s even forced Texas to accept a partnership with Mexico in his future. All of the atheists and socialists have been moved to the Union of American Socialist Republics and I can only imagine this is the ‘strategic ally’ Obama promised Putin “I will surrender America over I win re-election”. Obama is already making ways to dwindle the population of good, clean Americans with his use of EBOLA and respiratory virii. Obama is giving the Syrians American weapons, so they can ‘fight’ ISIS. Mark my words, they will turn those weapons on us and use it to defend Syria, Iran, New Iraq and Egypt from Israel/Christian Freedom Fighters in the final battles of these end days. These are the end times my friend. Just as the Bible predicted, this is a time of great famine and strife. The Earth opens up and swallows neighborhoods whole. The Blood Moon has appeared many times, just as promised in the Book of Revelation. Christians are being persecuted: schools arrest Christian children for praying, moral athletes are forced to turn the name of Christ away from fans and Republican journalists are constantly besmirched by the liberal media.